OK this is going to be so simple you will probably laugh and not really think it is worth much, lol. But this is a great way to use scraps and make something simple and giftable. You will need cardstock and scraps! Cut your 8.5 x 11″ sheet of cardstock into 5- 2″ x 8.5″ strips. Cut your scraps into 1.5″ x 8″ pieces. Then I deco stitched around the edges. You could finish it by laminating, or just leave! Great freebies for fairs or to give with cards, books, etc. 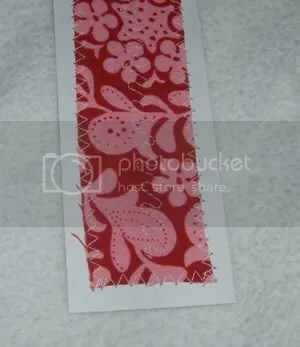 This entry was posted on November 12, 2008 at 1:24 pm and is filed under sewing, Tutorials. You can follow any responses to this entry through the RSS 2.0 feed. You can leave a response, or trackback from your own site. Love it! I can do this one. I love bookmarks too.